The Bayanihan Foundation’s NEXTGEN Project is inviting you to join a free film screening of “Amigo” a 2010 American-Filipino drama film written and directed by John Sayles. 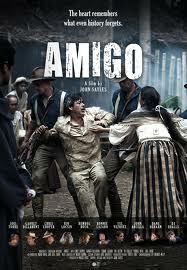 The film takes place in the Philippines in 1900 during the Philippine-American War. It is one of only a small handful of films directed by an American to address the war. Please join us on a lively discussion about this almost forgotten part of American history to encourage young Filipino Americans to learn more about their heritage and history. The foundation’s NEXTGEN Project encourages young Filipino Americans to learn more about their heritage, to become involved and eventually donate and help back to their homeland. James Castillo, first generation filmmaker, with VMPRDC (Visayas Mindanao Peoples Resource Development Center) from Los Angeles, CA, who works with youth using film to spread awareness about the need for environmental action. A special thanks to Prof. Maria Ferrera, Bayanihan Foundation board member and professor at DePaul University for putting this event together. This entry was posted in Philippines, Youth leadership development and tagged history, Philippines, US immigration. Bookmark the permalink.